When you ride as much as I do, no matter how well you take care of your gear it will eventually wear out. So is the case with my Garmin Zumo 450 GPS and my HJC SyMax II modular helmet. 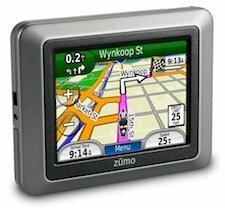 My Zumo 450 GPS partially crapped out in Nevada on a recent 5,000 mile trip. It still showed my current location, speed, elevation, etc. but the touch screen stopped registering my input. The unit had been reliable although it occasionally became confused, as most GPS units are prone to be from time to time. I had to navigate the rest of the trip the hard way, using paper maps and turn logs that I would plot out the night before. Getting around is easy enough the old fashioned way, but a GPS unit on your bike is very handy in some other ways. When you’re in a city, they can efficiently guide you to nearby gas stations, restaurants, and motels. In larger cities, they help you find your way through the concrete jungle to critical junctions and highways leading out of town. A GPS can also tell you how far you are from the nearest gas station, which is invaluable when determining if you should fuel up now or head on down the road. I replaced it with a newer model, it’s little brother, the Zumo 220. It is a no-frills unit that gets the job done with the features I need. Unlike the previous unit, the 220 uses a mini-USB connector to attach to the bike’s power. Rather than snapping it into its mounting cradle, you must first plug the mini-USB connector into the back of the unit, then lock it into the cradle. This is an extra step, and it makes me miss the docking station used by the 450. On the plus side, the 220 seems to lock onto satellites much quicker and the display is easy to see. I’ve yet to rely on it for city navigation or route plotting, but most of the functionality I need seems to be present. 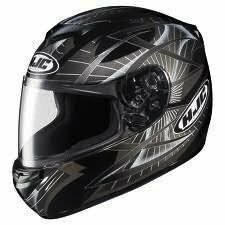 My first helmet was the HJC SyMax. It lasted about two years before an upgraded model came out, the SyMax II. Of course I upgraded, even though my old helmet was still functional. The SyMax II was comfortable and versatile and has served me well for several years and tens of thousands of miles. One of the drawbacks to both models, however, was an ill-fitting face shield. During moderate to heavy rain, water would run down the inside of the face shield because the top of the shield didn’t seat completely against the rubber gasket across the brow of the helmet body. On especially cold rides I could feel the chilly air coming through that gap and onto my cheeks. I’m loyal to the brand, both because of its value and because I know that their head shape fits me. My SyMax II has been showing its age lately and helmets should be replaced after 3-5 years of use anyway — due to the gradual collapse of the interior padding, lessening its protective effectiveness in a crash — so I shopped around for a suitable replacement. This time I decided to go with a full-face model instead of a modular design. I wanted reasonable cost and features, no internal flip-down sun shade, and DOT-only certification; no Snell rating (Snell rated helmets subject the human skull to higher G-forces in an impact event; look it up). I also wanted a helmet with a design pattern on the outside rather than the plain colors I’ve been wearing to date. I settled on the HJC CS-R2 “Storm” in grey. It is lightweight, has the feature set I wanted, and was surprisingly inexpensive. I paid $98 for it with free shipping from Motorcycle-Superstore.com. I’ve ridden about 500 miles with it so far and really like it. I have to get used to the fact that I can’t flip up the whole front part of the helmet like I could with my modular SyMax II. One downside is the face shield only has three detent positions; the first is barely open, which is great when fogging occurs, the other is in the middle and the top is all the way up. I wish it had 5 positions instead of three. The fit is fairly tight around my cheeks, so I find I ride with my mouth slightly open — this narrows my cheeks, basically. I’m assuming the padding will deflate slightly over time. The size was spot on; I wear a small in all three HJC models I’ve owned. There are no hot spots, either. Although the helmet is quiet, there is a slight amount of wind noise from the top air vents, even when the vent is closed. When I raise my head into the full oncoming rush of air above my wind screen I can tell that a decent amount of air passes through the helmet. This is handy when riding in hot weather. I’ve yet to wear the CS-R2 in rainy conditions, but close examination (and online reviews) show the face shield is pressed firmly against the brow gasket. Although I haven’t treated the inside of the face shield yet, it fogs up very easily. I also noticed the clear face shield that comes with the helmet seems to have a slight gradation of tinting or perhaps polarization from top to bottom. It’s subtle. I’ve ordered an additional shield, the HJ-09 in “Silver”, from Motorcycle-Superstore.com, to provide better tinting in sunny conditions. I just returned from a solo 5,000 mile trip around ten western states that took 16 days to complete. I left Oregon, went south to California, then across Nevada, Utah, and northern Arizona into Colorado. I then turned north into Wyoming and spent a night in South Dakota before turning west back across Wyoming, into southern Montana, across Idaho and back into Oregon. The trip ranged from sea level (the Oregon coast) to 14,115 feet (Pikes Peak) and saw temperature extremes from the upper 30’s (Beartooth Pass, Montana) to 120 degrees (Zion National Park). The farthest south was Kaibito, Arizona, the farthest east was Mt. Rushmore, South Dakota, and the farthest north was Missoula, Montana. From a gear standpoint, my bike — a 2007 Suzuki V-Strom 650 — ran without complaint. In the 5,000 mile journey it used up about 3/4 of quart of oil (which is pretty normal for modern bikes). The odometer rolled over 50,000 miles during the trip. My Garmin Zumo 450 GPS half-died about 1,000 miles into the journey. It’s 5 years old so that’s a pretty good lifespan for an electronic gadget that gets exposed to the elements. The standout gear of the ride, however, were my ExOfficio convertible pants. I wore them under my Firstgear Kathmandu riding pants and made the trip a lot more comfortable, especially when riding in high desert heat. They retain zero odor, and I could wash them in my motel sink, ring them out (roll them up in a towel and step on it) and they’d be dry in a few hours. Plus they are super light and pack really small, which is a huge bonus when traveling by motorcycle. The standout scenery was Beartooth Pass in southern Montana, just northeast of Yellowstone Park. The low point in terms of interest was probably Laramie, Wyoming. The town has the character of day-old dry toast. I met some really cool people (Jeff in Fortuna, CA; Pam in Deadwood, SD; and Myles and John in Greybull, WY) and saw some shameful racism in many rural areas toward our President. The trip went without a hitch, basically. There were no pucker moments or involuntary get-offs and no run-ins with law enforcement. It barely even rained — a few drops while visiting Mt. Rushmore. Speaking of Mt. Rushmore, it was probably the biggest disappointment of all the big-name places I visited. It’s much smaller in person than I thought it was from all the pictures and video I’ve seen of it on TV. In fact, the rock formations surrounding the monument are far more interesting. Devil’s Tower in northeastern Wyoming was kind of a ‘meh’ moment, too, not because it isn’t cool — it is — but because it’s exactly like I’ve seen in Close Encounters of the Third Kind. It was a kind of “Been there, done that” sort of moment. I hadn’t planned to visit Zion National Park but had to detour that way because of a road closure. Wow, what a place! I realize it’s cliche to say so but pictures can’t begin to do it justice. It’s as if Mother Nature consulted some big-name Hollywood filmmakers when designing it. When I go on these trips, I am often admonished by friends and family to takes lots of pictures. I took some, and I even took some video. In my tank bag was a GoPro HD camera and while riding I would often take it out and hold it with my left hand, filming various angles of the action. I’ve reviewed some of the footage and it worked pretty well. I plan to turn my photos and live footage into a produced video, with distribution to select individuals. Some photos will be posted here, but don’t expect too much. Philosophically, I have been taking the attitude that these places aren’t going anywhere; if you want to see them, go there yourself. I put in a lot of time, money, and sweat riding there and I feel somewhat reluctant to let others vicariously enjoy the benefits of that journey without paying some dues for the privilege. Sorry, but that’s just how I feel. Meanwhile, my bike is filthy and needs an oil change. My chain is also in dire need of replacement and my Aerostich Darien jacket looks like it’s been to the moon and back (I love that jacket!) I also have 7 GB worth of video to edit. I’ll report back when I have something to report. I ride an average of 9,000 miles per year, more than half of which is during long-distance trips. Those miles have occurred without a single get-off and took place during all types of weather and road conditions. During that time and over those miles I’ve learned a few things, some of which are included below. Most of these tips pertain to long-distance touring rather than short single-day trips or commuting. 1. Take classes and practice specific skills. Take the Basic Rider’s Course from the Motorcycle Safety Foundation to get your endorsement, then after 5-10,000 miles, take a more advanced course. I suggest Lee Park’s Total Control. 2. Don’t buy cheap gear. Quality is a higher priority than price. Quality gear is usually more comfortable, making the ride more enjoyable. 3. When buying gear, get pants and a jacket that is waterproof via the outer layer. Gear that uses a removable waterproof inner liner is a waste of time and money. 4. Rub Pledge furniture polish on the outside of your face shield to make rain bead up and run off. Rub shaving cream on the inside of your face shield to prevent fogging. 5. Keep some kind of tool kit on your bike. My suggestion for its contents are: flat repair kit, DC air compressor, electrical tape, adjustable wrench, allen wrenches, multi-tool, small can of WD40, rubber gloves, paper shop rags, and one large black plastic bag. 6. Keep a bottle of water and a power bar in your tank bag. It’s also a good idea to keep a half-roll of toilet paper in a ziplock bag. 8. Look down at your side stand when you put it down. Be sure of the surface before resting your bike’s weight on it. Crush a pop can and put that under the side stand foot to give it more stability on loose surfaces like gravel or sand. 9. Leave cotton clothes at home. Use merino wool socks, even in the summer, and wear synthetic wicking underwear and t-shirts as your base layer, especially during warmer rides. In colder weather, use polar fleece as an insulating layer under your jacket and pants; bonus points if your polar fleece is the wind blocker variety. 10. When it’s hot, wear a vented or mesh jacket and get your t-shirt wet underneath. You’ll actually get a better evaporative cooling effect this way than riding without the jacket at all (warm air compresses against your chest and is actually warmer than the ambient air temperature). 11. This is a tip about riding in general rather than specific to long-distance touring: look ahead, don’t look at the road right in front of your bike. Your cornering will be a lot smoother and more efficient, and you’ll even be able to take the same corner faster than you would otherwise. Never drink and ride. Ever. No exceptions. Your ability + current conditions = riding safety margin. Never exceed this. Take care of your bike. Pay attention to maintenance items like fluid levels, tire wear and pressure, chain cleanliness, etc. Ride respectfully. Be courteous to other riders regardless of their brand of bike. Be respectful of the communities you ride through. Be a positive reflection of motorcyclists and never leave a negative impression of riders upon those you meet. Some people consider All The Gear, All The Time (ATGATT) to be a flexible matter of personal choice. I don’t. I consider it a basic rule that should never be broken. I value my health and safety too much to violate the rule or even bend it, regardless of conditions. Always wear a helmet, even if one is not required by law. Keeping your brain contained inside your skull is more important than keeping the wind on your face. Never buy a used helmet. If you drop your helmet, replace it. They suffer internal damage that is not visible or detectable and you need it to be factory-fresh in case of an accident. Looking good is nice, but never sacrifice safety for the sake of fashion. If another rider needs assistance, do what you can to help. You may need help someday and good karma is a handy thing.